The Path to Productive Writing (Even in the Summer) | Writing & Book Coach | Marla Beck, M.F.A. Summer. Is this time of year frustrating and destructive for your writing? If so, let’s chat. Some days, I experience summer as a languid and almost sensual force of flow and ease. This midyear season can be quite lovely as it cloaks us with heat, warmth, spaciousness, and an unmistakable invitation to have fun, take it easy and play. Other times, summer swoops in disruptively. It’s as if the season itself trails a thick cape of unsettledness that accidentally and continually brushes against so many areas of life. Week after week requires fresh adjustments and re-adjustments, in order to accommodate shifting schedules, physical energy that varies with the temperature, and fun-but-attention-consuming challenges, like keeping a grade-school kid home and busy for weeks. If you have school-aged kids at home, you know what I mean. If you have a thriving garden, a long vacation or family reunion on the calendar, or if you’re sensitive to the heat and lazy energy of summer, you know what I mean. Summer can be a fun and lovely time of year. Summertime can also destroy a consistent writing habit or creative routine! Part of our job, as writers and creative men and women, is to manage, support and recalibrate our writing practices, our expectations and our focus. Summertime, for many, is THE time to learn the fine art of adjusting to variance, disruption and unsettledness. The good news? Once you master the art of adapting your writing goals and practices to truly WORK with your unique life and truest priorities, you are able to navigate the rest of the year – in fact, the rest of your writing life and career – with a clarity, resilience and focus that no future vacation, distraction or life disruption can take away from you. You become a writer who, no matter what’s tugging at her attention, knows deeply and exactly who she is, why she writes and what matters most in any given moment. Steady writers gain the wisdom to be one’s own coach: setting meaningful, attainable goals; motivating oneself to write from the inside-out; transforming fears, writing blocks and anxiety into productive writing sessions; and keeping consistently focused, engaged-with and eager about writing… no matter what. Learn the art of steady writing and you will learn all you need to become your own coach — someone who is easily able to direct and manage her own productivity and writing career… no matter what. You’ll stay steady and happy with your writing… even when you become time-starved, exhausted or desperately needed in other areas of your life. 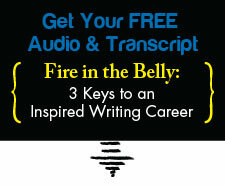 Need help fitting your writing into the rest of your life? I’m here to help you. Contact me today and let’s get you relief. Fast. Previous post: Discouraged with Your Lack of Writing Progress?